Cool and refreshing! The perfect summer treat that you can recreate by using different jello and yogurt flavors along with your favorite fresh fruits. Your family will love this incredibly easy and mouthwatering dessert! In a large bowl, whisk the jello and boiling water until jello dissolves. Add the strawberry yogurt and combine well. Fold in the cool whip and add pieces of fresh strawberries. 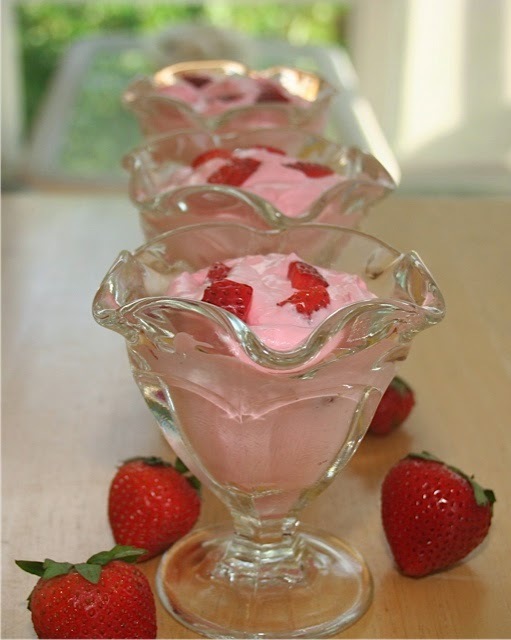 Spoon into dessert cups or ramekins and place in refrigerator for several hours. Enjoy! (Note: My husband and kids didn't even want to wait until this dessert set in the refrigerator. I barely had time to spoon it into cups before they devoured it!) :) If you'd like a printer-friendly version of this recipe, Click Here. Knowing that I can satisfy my sweet tooth without putting on the pounds? Well, that just makes me happy! Especially when it comes to enjoying one of my favorite chocolate candy bars, Butterfinger! Line the bottom of an 8x8 inch baking dish with the graham cracker sheets. Slice and layer the banana on top of the graham crackers (optional). Mix together the cool whip with half of the crushed Butterfinger candy bar. Spread the cool whip mixture over the graham crackers and bananas. Drizzle both the chocolate syrup and caramel syrup on top of the cool whip and sprinkle remaining crushed Butterfinger on top. Freeze for at least 2 hours. Enjoy! If you'd like a printer-friendly version of this recipe, Click Here. Such a savory dish! This delicate mahi is seasoned to perfection and pan fried in organic coconut oil. The lightly seasoned kale chips not only offers an extensive amount of vitamins and nutrients, but when baked, their soft crisp texture makes them just as easy and addicting to eat as potato chips! Heat coconut oil over medium-high heat in a large skillet. Sprinkle both sides of the mahi with dill seed, bread crumbs, salt, and pepper. Place fillets in skillet and cook for two to three minutes on each side. Remove and enjoy! Preheat oven to 425 degrees. Cut cup fresh kale into medium-sized pieces (cutting out and discarding the center stem). Cut enough to cover a large cookie sheet (kale will shrink when baked). Place kale on baking sheet and sprinkle kale with olive oil. Sprinkle with salt, pepper, onion powder (optional), and garlic powder (optional). Bake kale for 12 minutes or until the texture is crisp. Some kale may get a little blackened on the ends but it does not take away from the flavor! Remove, let cool, and enjoy! "The difference between 'try' and 'triumph' is a little 'umph'".